« Prepare – Withstand – Adapt – Recover. Emit – Capture – Utilize – Store. In January 1972 the Val Verde (now Terrell) natural gas process plant started to capture carbon dioxide (CO2, or, short, “carbon”) and transport it in a pipeline to the Kelly Snyder oil field in West Texas. It was the first commercial use of CO2 for enhanced oil recovery (EOR). EOR had been slow in the making. The first patent for EOR was issued in 1952 and field test had been done in 1964, but in the last three decades EOR has become a well-established technology in the North American oil industry. Most of the CO2 comes from naturally occurring sources. CO2 is the main anthropogenic (human induced) greenhouse gas (GHG), about 76 %. Consequently, it is the focus when addressing global warming. The Paris Agreement, which was adopted by consensus 2015, aim to keep global temperature rise this century not only to maximum 2°C (degrees Celsius) above pre-industrial levels, but to pursue efforts to limit temperature increase to 1.5°C. In the Paris Agreement, each country determines its own contribution to reduce GHG emissions. There are no enforcement provisions, but a commitment to report results every five years. Already 2°C goal is ambitious, considering that first half of 2016 average temperature was about 1.3°C above the average in 1880, when global record keeping began. Climate Action Tracker, which covers 32 countries with 80 % of the global emissions, has modeled temperatures and tracks progress. Their baseline scenario, “the business as usual case”, estimates temperatures will be 4.1 – 4.8°C higher 2100. If countries stick to currently adopted policies to reduce GHG emissions, the temperature rise is estimated to be about 3.1 – 3.9°C. 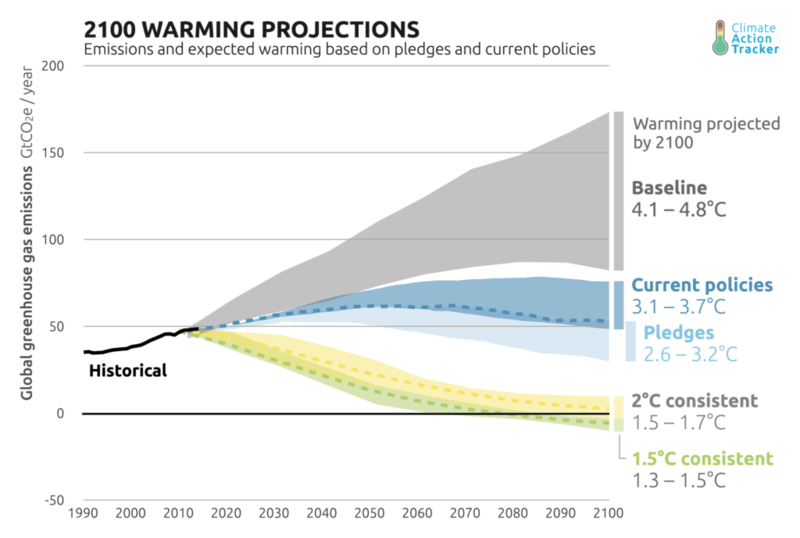 If countries would live up to their recent pledges the estimate is 2.6 -3.2°C. Evidently, much more actions will be needed to reach the 2°C and 1.5°C goals. Source: Climate Action Tracker. The Baseline case is based on IPCC (Intergovernmental Panel on Climate Change) Working Group III report on Mitigation (2001). The power sector has the largest CO2 emissions. It is also the most concentrated source of CO2 emissions. Coal fired generation is about 40 % of all power generation worldwide, with the large growing economies of China and India, each at over 70 %. Already in the late 70s/early 80s it was recognized that for coal to remain a primary energy source in a carbon constrained world, the CO2 had to captured and stored. Source: Boden,T.A., Marland, G., and Andres, R.J. (2017). 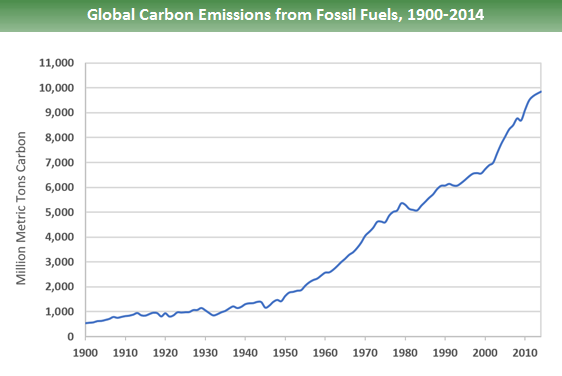 Global, Regional, and National Fossil-Fuel CO2 Emissions. Carbon Dioxide Information Analysis Center, Oak Ridge National Laboratory, U.S. Department of Energy. Based on the Val Verde and other EOR projects, carbon capture and sequestration (CCS) was first suggested in 1977 as a possible path forward for fossil fuel power generation, particularly coal. International Agency (IEA) established 1991 an international collaborative international research program (IEA Greenhouse Gas R&D Program, IEAGHG), which includes CCS. Several billions of dollars in R&D and pilot projects have been invested by USA, Canada, Norway, Australia and other countries. Worldwide, there are about 15 large scale CCS projects in operation (2016) and 5 more in construction. Most of the plants capture CO2 in connection with industrial processes like natural gas processing, fertilizer production, etc. The most common storage application is EOR. First power plant with CCS was Boundary Dam in Saskatchewan, Canada (2014). A 139 MW lignite coal-fired generating unit was retrofitted with post-combustion capture technology, removing over 90 % of the CO2 from the flue gas. Half of the captured CO2 is compressed and injected into a pipeline to an oilfield for EOR. This 1.24 BCAD project received major financial support from the Government of Canada as well as the Government of Saskatchewan. Results, so far, are not encouraging. A Parliamentary Report (April 2016) found that the CCS doubles the price of electricity. 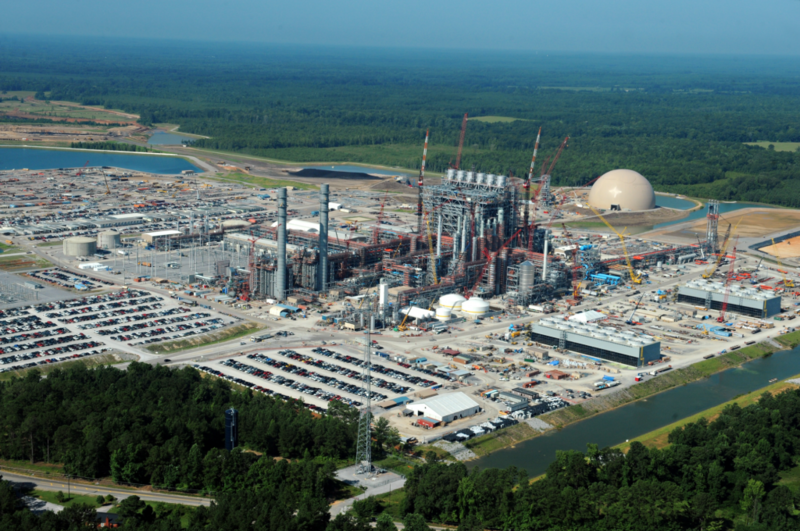 Kemper IGCC (integrated gasification combined cycle) plant, Mississippi, USA. Initiated in 2010 the 582 MW power plant was at that time the most ambitious pre-combustion capture power plant project with CCS for EOR, using local lignite coal as feedstock. The goal was to capture 3 MT of CO2 per year. After major delays and huge cost overruns (from the original $2.88 billion to $7.5 billion) the coal gasification was suspended in June 2017 and changed to natural gas. With the intent to make it easier to capture and purify CO2 from a coal power plant the oxy-fuel process was developed. In this process the fuel is combusted in oxygen, diluted with recycled flue-gas, producing a more concentrated CO2 stream in the final flue-gases. In 2008 a 30 MW pilot plant was commissioned at the large coal power plant Schwartze Pumpe in Germany. The captured CO2 was compressed and liquified for later injection into a depleted gas field, 3000 meters below surface. In 2014 Vattenfall, the then owner of the plant, stopped the project after concluding that the “costs and the energy it requires makes the technology unviable”. In February 2015 also the U.S. Future Gen 2.0 oxy-combustion project in Meredosia, Illinois, with planned CO2 sequestration in a deep saline aquifer, was cancelled. An average coal power plant at 500 MW emits about 3.5 MT of CO2 per year. A natural gas fired combined cycle gas turbine (CCGT) plant is about twice as efficient and emits half that amount of CO2. 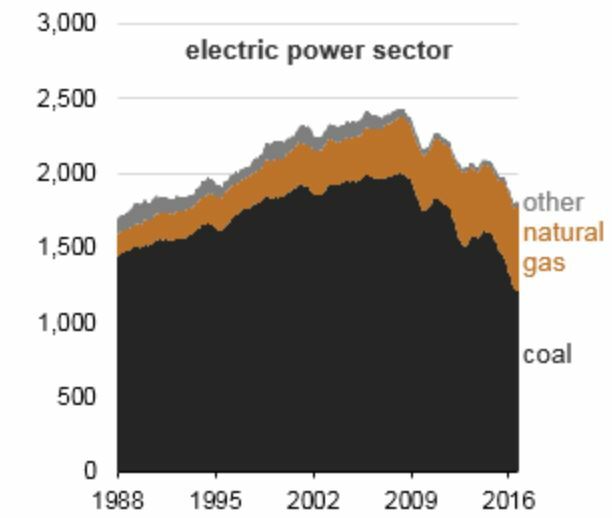 The rapid transition from coal to gas in the U.S. electric power industry is also the main reason why the C02 emissions from fossil fuels in the U.S. have come down substantially in the last 10 years, resulting in the transportation sector has become (2016) a larger source of carbon emissions than the electric power sector. However, to reach the Paris Agreement targets, ultimately, the CO2 emissions from the natural gas power plants will need to be captured or offset by other means. USA. Electric Power Sector CO2 emissions, rolling 12-month total, million tons of carbon dioxide. In the period October 2015 through September 2016 coal represented 31 % of all power generation in the U.S. and natural gas represented 34 %. Source: EIA Today in Energy, January 19, 2017. To keep the warming to 2°C above the pre-industrial levels, it is a widely recognized view that the CO2 concentration needs to stay below 450 ppm. Latest measurement (December 2017) by NASA showed 407 ppm. 30 years ago (1988) it had reached 350 ppm. Before the industrial revolution the level was about 280 ppm. Some climate experts like James Hansen and Makiko Sato, using paleoclimate data and taking the interaction between CO2 and other GHG emissions in consideration, conclude that the temperature rise goals should be set lower than 2°C, and to achieve that the CO2 concentration needs to be 350 ppm or less. Large scale retrofitting of existing coal power plants with CCS may not be a viable solution, since most of the existing plants are not located close enough for EOR or at suitable geological formations for sequestration. Realizing this big challenge, new concepts, other than storing the CO2 in the ground, to utilize the captured carbon are being proposed. For example, researchers at UCLA have demonstrated (2016) a concept to create a new building material, C02NCRETE, potentially substituting traditional concrete. It is too early to tell whether this or other concepts will be possible to bring all the way to commercial grade products. Nevertheless, it makes sense to expand CCS to CCUS (Carbon Capture Utilization and Storage). Taking CCS, a step further, by combining it with bioenergy would deliver “negative emissions”. This idea, BECCS (Bio Energy with Carbon Capture and Storage) has gained interest as a potential way to offset higher emissions elsewhere in the energy system. The BECCS concept has been demonstrated at Archer Daniels Midland’s ethanol plant in Decatur, Illinois, capturing about 1 MT CO2 per year. DOE provided $141 M in funding of the total $208 M. However, to truly count as negative emissions the bio energy needs to be sustainable. In the very frontier of “negative emissions” is the concept of direct-air-capture (DAC). Three early stage companies, Carbon Engineering (Canada), Climeworks (Switzerland) and Global Thermostat (USA), are developing technologies for DAC and utilization and storage processes. At the Hellisheidi geothermal plant on Iceland, Climeworks started in October last year (2017) a pilot DAC plant for 50 tons CO2 per year combined with a storage process developed by CarbFix, a project started in 2014 and led by Reykjavik Energy. In this process a mixture of water and CO2 is injected 700 meters underground in a basaltic rock formation. Scientists have found that mineralization can occur in two years, eliminating the risk for release of CO2. Carbon Engineering is pioneering “air to fuel”. This carbon neutral concept is to have the captured CO2 from DAC to react with hydrogen produced from electrolysis of water, powered by renewable energy sources. It is an interesting way to use renewable energy in decarbonizing transportation sectors, which are difficult to electrify. The “thermo-catalysis” process directly synthesizes the CO2 and the hydrogen to a liquid fuel. 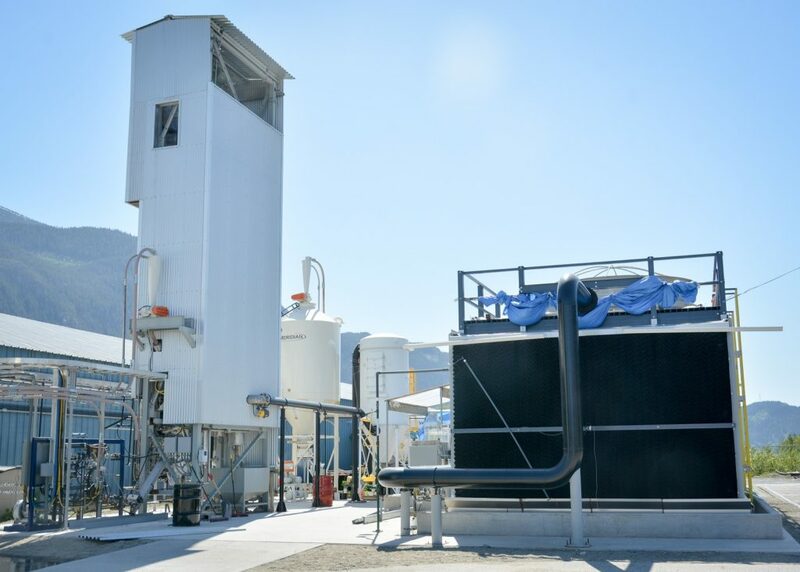 A first pilot plant for DAC was built in 2015 at Squamish, British Columbia. Late last year (2017) Carbon Engineering in partnership with Greyrock Energy demonstrated the concept in its pilot plant. Carbon Engineering, Squamish, BC, Canada. This pilot plant, built in 2015, has the capacity to capture and purify 1-ton CO2 from air per day. In 2017 it was expanded with a synthetic fuel process, using the captured CO2 as feedstock together hydrogen, producing about a barrel of liquid fuel a day. If the ambitious targets of the Paris agreement are going to be achieved, it will need “all of the above actions”. CCUS and BECCS will be among them. The core concepts work, but much more development is needed to make the technologies more robust and reduce costs. Pricing carbon, by taxes or by cap and trade programs, is a prerequisite. Let markets stimulate innovation and drive down costs! More importantly, markets will also help value CCUS and BECCS against other alternatives to reduce CO2 emissions, like energy efficiency, renewable energy sources, nuclear energy, etc. After all, what really matters are the hard numbers of reduced CO2.